We've been off-the-radar for the last month. Our 12-month Australian tourist visas expired in October (see A Flexible Life) so to comply with authorities we flew out of the country and reapplied for new visas. The process has been a rather challenging 6-week ordeal, the most complex visa application we've encountered in over 10 years of cruising. But we're relieved to report that our new visas have been granted and we're free to return. 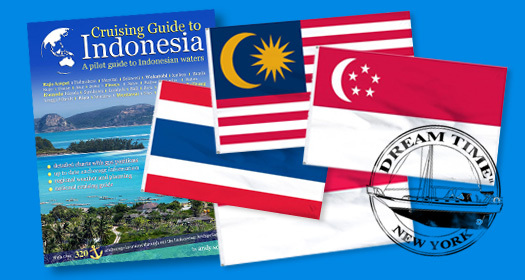 We've got a big year ahead, after 9 years of South Pacific cruising we'll be entering an exciting new territory - Asia: Indonesia, Borneo, Singapore, Malaysia, Thailand... To prepare we've ordering courtesy flags for the region, cruising guide books and spare boat gear. We've even designed a ship's stamp as, apparently, few procedures are more satisfying to Indonesian officialdom than the authoritative and definitive action of a vigorously stamped document - in triplicate.